The Kasbah nightclub in Coventry has been handing out condoms to students from Warwick and Coventry Universities, with just one major problem. But if you look closely at the tiny writing on the "condom" packets you'll see they say "not intended for use" underneath the massive writing which reads KASBAH LOVIN'. Photos of the "condoms" via their Facebook page. 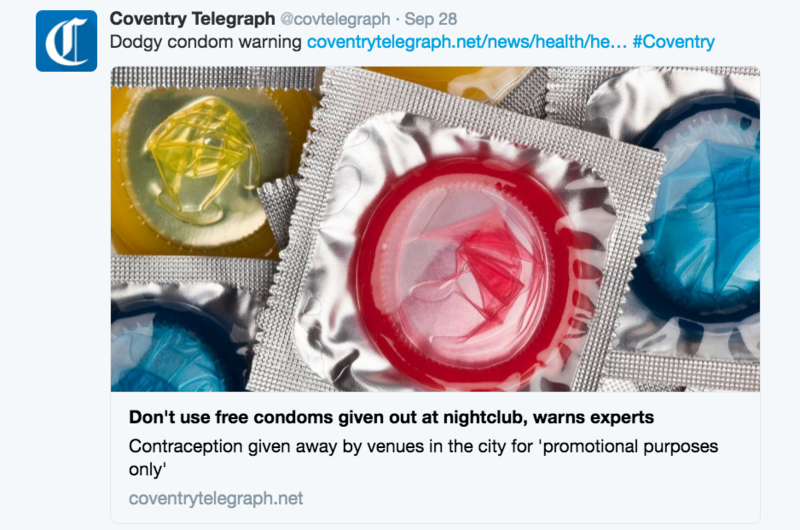 After the the Coventry Telegraph published a piece warning locals about the dodgy condoms, Kasbah responded by saying they were for "novelty purposes only" and "not recommended for use". They went on to explain "most students can read", as if all drunk clubbers will immediately read the small print of a condom, just in case they turn out to be "mementos". In a further statement to the Coventry Telegraph, Kasbah explained that the condoms were intended as a keepsake. “As they were for promotional purposes and carried the Kasbah logo, we actually wanted people to keep them so they were printed with ‘not recommended for use’ on the wrapper. "It is understood that contraception may be being distributed at social venues across the city, particularly aimed at new university and college students, which are for promotional purposes only and don’t feature safety markings and which may fail when used." Kasbah have since gone on to say that the condoms are in fact safe, and they have the certification to prove it.